As times change and people's interests change, it is important to be flexible and creative with activities in senior living communities or in senior centers. Here are a few ways to get "outside the box" with your approach. 1) Ensure seniors have a chance to give back to the community. They have been caring for others their whole lives so this is a time when they still may want to be volunteering and doing for others as well. 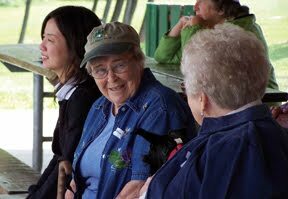 Give older adults the opportunity to connect with youth in the community. Seniors have their rich and interesting life stories to give, and the younger person gains more from this living history than any history book. We've found that young people's lives are changed from hearing these stories (they realize how lucky they are) and they appreciate the older generation so much more. LifeBio's Connect program could help bring youth and adults together with reminiscence tools and training. 2) Bring everyday life into the daily experience and highlight what certain people love. So maybe everyone doesn't enjoy stamp collecting, but a resident named Bill sure does. Cookie cutter activities just don't work for everyone. There's no reason why you can't focus on Bill's love of stamp collecting and think about ways to make his day or week--while at the same time involving other residents in learning about his joy during that time. Perhaps you bring in an unusual speaker--someone who knows the history of stamps to present some history on this topic OR tour the local post office. One-on-one visits could involve letter writing--and choosing a beautiful stamp for the letter. NOTE: The best way to find out about Bill's love of stamp collecting may be by listening to his life story first. The Life Story Journal or Memory Journal could help. 3) Bridge the gap between family and residents. Frankly, they don't know what to do when they come to visit. They don't know what to say. It's your job to help them have a project...or something to talk about that isn't the "same old, same old" stuff. Instead of the big 4---weather, health, sports, and food ("How was breakfast?" or "How's your knee feel today?" is really no fun to talk about anyway. YAWN) So it will work well for you to provide conversation starters or other reminiscence ideas to involve the children and grandchildren in the life of their loved one. When it's FUN to visit, they will want to visit more often. And that's good for you and it's very good for them! The resident and his or her family can make a Storyboard display or use Story Cards with thought-provoking "outside the box" autobiography questions as visiting ideas. Enjoy your time with each person--celebrate each person's amazing uniqueness. He or she has gifts to share--especially their life stories. Even with some memory loss, many older people remember their childhood years like it was yesterday--so it's a good thing to talk about. Share your life with them and they will share their lives with you. Your job is so important--for you are the community builder and the love giver.